This Weeks News: Bevan's making his comeback, Challenge announces more races, John's ITU update, Time Don going long, Inside Tri's 10 most influential people. 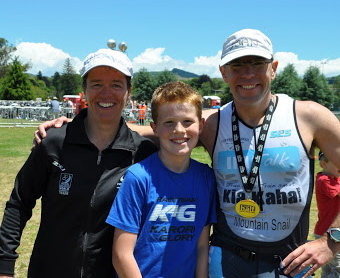 This Weeks Photo: The Mountain Snails Family, Dad looking great in his IMTalk Tri Suit. This Weeks Discussion: On this weeks show we confirmed our names for the different level of IMTalk IM finishers. We now need you to come up with the second name, this will make sense when you listen to the show. Also what do you think were the top 3, either male or female, performances of 2012? Comment here. Age Grouper of the Week: Marcel sent through Doug Neil and a race that the Banora Tri Club puts on every week. The sprint course race happens 26 times a year. Over the years Doug has done the race over 600 times! That's wicked work.